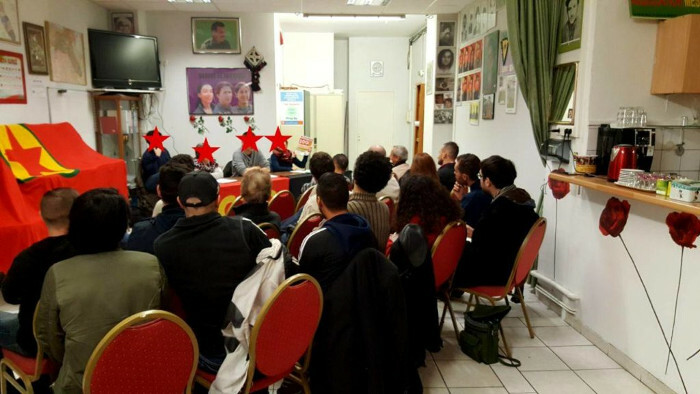 For two years now, the UPML (Marxist-Leninist Proletarian Union) and the UCL (Communist Unity of Lyon) have been working together towards the unity of revolutionary communists on the way to build the foundations of a revolutionary and communist Party which we are desperately short of in our State. This activy brought us to get involved in ICOR (International Coordination of Revolutionary parties and Organizations) first as Friends of ICOR, as a support, but soon as full members of this international coordination which unites revolutionaries from four continents. At the beginning of November 2018, we got together to work on our tasks but also to take part in a common event. 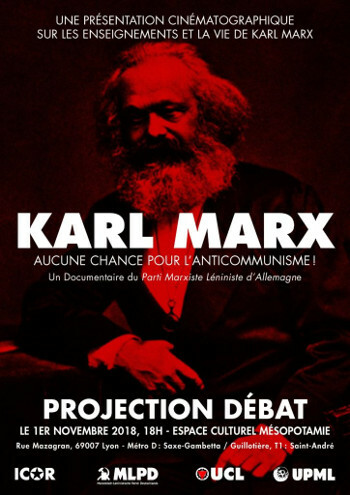 The UCL organized a screening-debate with the film Dem Antikommunismus keine Chance- No chance for anticommunism, made by the MLPD (Marxist Leninist Party of Germany). To show films made by a sister-organization is concrete proof of what communist organizations can gain by working together and by sharing resources and efforts. The UCL and the UPML co-chaired this screening and presented the ICOR as well as the MLPD. We thank our comrades from the Cultural Center of Mesopotamia for their welcome, on the day of the battle of Kobane commemoration. It was the first time the young UCL organized a screening-debate. It was nevertheless a success. Many people came, some who weren't necessarily activists, being interested in marxism, attracted by the posters, by the list of organizers and by the discovery of logos of organizations they didn't know. The screening was followed by a large debate, not only on marxism but also on «how to get organized be stronger and beat capitalism ?». For us, these questions reveal more than a simple intellectual curiosity, they also show concern for the concrete and real struggle. This common activity was the first landmark of our cooperation beyond just publishing common declarations or common analyses. This activity calls on others. Together we will march side by side with our comrades of ICOR, at the demonstration of the three Ls – Lenin, Luxemburg, Liebknecht - in Berlin in January, commemorating the Spartakist revolution in Germany. Both our organizations got together to develop our collaboration. The UPML and the UCL can say they share a common vision of the current situation and of how to unite more, with an open policy of debate towards other organizations which claim to be communists, with a will to offer a revolutionary alliance. We agree when we note organizations' sectarism leads to mutual ignorance, to controversies, to permanent conflict and it has lasted long enough. Burying one's head in the sand and denying the existence of other political forces wanting a socialist revolution cannot go on. To speak the words of a comrade from Rode Morgen (Netherlands), member of ICOR «If we agree on 80 %, let's work on reinforcing that agreement and let's discuss the 20 %». We want to offer all revolutionary communist organizations to cooperate within a revolutionary alliance, capable of going beyond the current fragmentation towards the tasks communists set themselves. We want to work together to build a Revolutionary Communist Party, capable of summing up the experience of the revolutionary working class movement and of beating the bourgeoisie. We also spoke of our future integration of ICOR, to whom we have sent a full membership request. By doing so we wish to overcome the international isolation and to beat the chauvinistic tendencies which exist within the communist movement in France. We think it is necessary to create an ICOR commitee in France to unite those who wish to take part in the international solidarity and coordination, as well as in organizing locally events impulsed by ICOR (International Day against war, International day for women's rights, May 1st, preservation of nature,etc). Our organizations will carry out a common campaign, during the european elections to denounce the nature of the EU as an alliance uniting european imperialisms- especially french imperialism- and as a reactionary, antiworker, militarily agressive bastion. This first common campaign, implused by ICOR will also be a new landmark towards a stronger cooperation and a bigger unity of our organizations, allowing us to share experience, work, energy and to head towards the construction of the Party we are lacking. Together towards the construction of the Party! Towards a revolutionary alliance! Let's reinforce ICOR! Long live communism! Long live the revolution!